The coat of arms of Norway is a standing golden lion on a red background, bearing a golden crown and axe with silver blade (blazoned Gules, a lion rampant Or, crowned Or, holding an axe Or with a blade argent). The coat of arms is used by the King (including the King's Council), the Parliament, and the Supreme Court, which are the three powers according to the Constitution. It is also used by several national, regional, and local authorities that are subordinate to the aforementioned, for example the County Governors and both the district courts and the courts of appeal. Since 1905, two parallel versions exist: the more elaborate version used by the King and the simpler one used by the State. The arms in banner form serve as basis for the monarch's flag, known as the Royal Standard. In addition, there are former and existing lands (e.g. the Earldom of Iceland and the Orkney Islands), cities (e.g. Kristiansand), organisations (e.g. the Museum of Cultural History), companies (e.g. Adresseavisen), and families (e.g. the Counts of Gyldenløve and Gudbrand Gregersen) who have been granted the right to bear the coat of arms or derivations of this. Unless officially granted, it is illegal to use the coat of arms. The arms has its origin in the 13th century, at first just as a golden lion on a red shield, with the silver axe added late in the century, symbolising Olaf II as the Eternal King of Norway. In origin the arms of the Sverre dynasty, the coat of arms became quartered with that of the Bjälbo dynasty when the Sverre lineage was extinct in 1319, and the Sverre coat of arms figured as part of the further divisions of the coats of arms of Norwegian kings during the early modern period. The Sverre coat of arms was regarded as representing the Norwegian monarchy in the late 15th century, and it came to be used to represent Norway on coins and in seals during the union with Denmark (1523−1814) and the 19th-century personal union with Sweden, its 13th-century origins placing it among the oldest state coats of arms which remain in contemporary use. The axe tended to be depicted as a curved pollaxe or halberd from 1500 until 1844. The 1844 design approved by king Oscar I reverted to the depiction of a battle-axe as shown in medieval designs. After the dissolution of the union with Sweden in 1905 a medieval-type escutcheon and charge was designed by Eilif Peterssen. Peterssen's design would be used until 1937 when it was re-designed by state archivist Hallvard Trætteberg, resulting in a markedly different, more simplified design style. Peterssen's design has, however, been retained in the Royal Standard and coat of arms. The Lion of Norway (Den norske løve) has been a popular and embraced symbol for centuries. This popularity is, not least, visible in older folk art. The design of the coat of arms is derived from that of the Sverre dynasty. Hallvard Trætteberg in 1814 suggested that Sverre, who was king between 1184 and 1202, had a lion in his coat of arms, although there is no direct attestation. Snorre Sturlason claims that a golden lion on a red background was used already in 1103 by King Magnus III, the son of King Olav III. Gustav Storm in 1894 concluded that this is ahistorical. Storm explained that the claimed lion in King Magnus's coat of arms is unknown both in the older Saga literature and in other contemporary sources. It is possible that Snorre, who wrote under the instruction of the King, attributed King Sverre's coat of arms to earlier Kings of Norway. A lion is shown on the coat of arms in the seal of Earl Skule Bårdsson, dated 1225, who had relations to the royal family. Haakon Haakonson the Old had a lion in his seal, shown as lying between the feet of the seated king. A royal coat of arms with a lion is finally seen on the seal of Haakon Haakonson the Young, dated 1250. The first instance of the lion bearing an axe is found in a seal of Eric II (1285). Earl Skule Used in 1225. King Haakon the Old Seal of 1247/1248, in which a small lion lies between the King's feet. King Haakon the Old Reverse of the latter. King Haakon the Young Seal of 1250. King Eric II Seal of 1298. Whilst the lion in the shield does not appear to bear an axe, the one on the caparison does. Approximately in 1280, either King Magnus VI (dead in 1280) or the guardianship of his son Eric Magnuson let the lion be equipped with a crown of gold and in the foremost paws an axe of silver. The axe was a symbol of Saint Olaf, i.e. King Olaf II, and by inserting it into the coat of arms it symbolised that the King was the rightful heir and descendant of the 'Eternal King of Norway' (Latin: Rex Perpetuus Norvegiae). King Eric II Seal of 1285. King Eric II Seal of 1283 and 1285. This is a variant in which the shield has flowers. Duke Haakon Magnusson Seal of between 1292 and 1298. King Haakon V Seal of between 1300 and 1302. Duchess Ingeborg Seal of 1318. King Haakon VI Seal on documents between 1358 and 1369. King Haakon VI Seal on documents between 1358 and 1376. King Olaf IV Seal of 1382 and 1384. Queen Margaret Her seal as Norway's sovereign. She holds both an Olaf axe and the Royal Coat of Arms—a powerful symbolism. With the death of King Haakon V in 1319, the reign of the Sverre dynasty came to an end. The Throne and thus the Royal Coat of Arms was inherited by Magnus VII, who was a maternal grandson of Haakon V and who himself belonged patrilineally to the family known as the Bjälbo dynasty. Subsequently, Norway remained in personal union with neighbouring countries. When acting as the ruler of one particular country, the sovereign would normally use the arms of that kingdom. When acting as sovereign of the united kingdoms, he would marshal the escutcheon by quartering. This was a tendency in Europe in general. The first union kings placed the Royal Coat of Arms in the first quarter of the quartered coat of arms. At the beginning of the Kalmar Union, Norway as a hereditary kingdom was considered more important than Sweden and Denmark, which were still electoral kingdoms. Consequently, King Eric III of Pomerania placed his Norwegian Coat of Arms in an inescutcheon, superimposed on the coats of arms of his other realms. However, the Norwegian Coat of Arms would later be degraded, so that the Coat of arms of Denmark would occupy the first field, whilst Norway's was placed in the second. King Magnus VII (r. 1319–1343) Coat of arms as presented in the Gelre Armorial. The royal coat of arms is combined with that of the Bjälbo dynasty, to which Magnus belonged patrilineally. It displays the original crest of the Norwegian coat of arms. Modern interpretation of the coat of arms of King Christopher. In 1450, Count Christian of Oldenburg and of Delmenhorst became King of Norway. He was already King of Denmark since 1448, and in 1457, he became King of Sweden as well. Norway's coat of arms was placed in the lower dexter field and, when Sweden left the Kalmar Union in 1523, in the upper sinister field. The latter lasted until 1814. On 4 November 1814, the Norwegian Storting elected King Charles XIII of Sweden as King of Norway. This personal union with Sweden lasted until the dissolution of the union between Norway and Sweden in 1905. Without legitimate heirs of the body, King Charles adopted the French marshall Bernadotte, Prince of Pontecorvo, who took the name Carl Johan. The union arms introduced by King Charles XIII and Crown Prince Carl Johan were never used officially in Norway. Only the lion coat of arms of Norway appeared on coins and on seals of official documents signed by the King in his capacity as Norwegian king. The union arms introduced by King Oscar I in 1844 was used by members of the royal family, by the common diplomatic service of both kingdoms, and on official documents concerning both countries. In Norway, the union arms was never used on coins or official documents. In Sweden, Crown Princes and Princes bore the coat of arms belonging to his duchy. See Duchies in Sweden (but these titles and arms were never used in Norway). The halberd was officially discarded and the shorter axe reintroduced by Royal Order in Council 10 July 1844, when an authorised design was instituted for the first time. On 14 December 1905 the official design for royal and government arms was again changed, this time reverting to the medieval pattern, with a triangular escutcheon and a more upright heraldic lion. The painter Eilif Peterssen was responsible for the design. King Charles III John (r. 1818–1844) All achievements are not displayed. During the Quisling regime under the German occupation of Norway a new design by Wilhelm Frimann Koren Christie (1885 – 1956) was introduced 18 December 1943, rarely used, but depicted on a 1945 postage stamp. Through centuries and following changing fashions in heraldry and arts, the coat of arms has appeared in several ways in the matter of design, shape, and so on. In the late Middle Ages, the axe handle gradually grew longer and came to resemble a halberd. The handle was usually curved in order to fit the shape of the escutcheon (or the changing union quarterings) preferred at the time, and also to match the shape of coins. 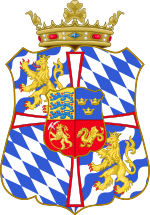 The coat of arms has also been used by subordinate state authorities and in semi-official contexts, such as on bank-notes. Coat of arms of Norway within the coat of arms of the Police. Royal decree of 20 May 1927 states: The coat of arms of the Realm may be used only by the state's authorities in the exercise of their official activity. The coat of arms may be used by the Royal Court, by the government and its ministries, by the parliament, by the law courts, and by some others. Matters of the coat of arms are treated by the Ministry of Foreign Affairs. The state coat of arms has no achievement save the surmounting crown. The royal coat of arms is defined in the resolution of 30 December 1905. In the coat of arms of the realm, a heraldic royal crown is placed directly on top of the shield. In the royal coat of arms, the shield of the arms of the realm is on a mantle purple lined ermine with a royal crown on top. Three sides of the shield are surrounded by the collar of the Royal Order of St. Olaf. The following coats of arms are displayed with the collar of the Order of St. Olaf. However, not all Princes and Princesses are Grand Cross holders or, for that sake, members of this order at all, wherefore their respective coats of arms do not include this achievement. The current Royal Standard of Norway is the Norwegian arms in banner form. ^ Rigsarkivet i København, 860, Håndskriftssamlingen I, Terkel Klevenfeldt (1710–1777), Dokumenter vedr adelige familier, pakke 48. Wikimedia Commons has media related to Coats of arms of Norway. Hans Cappelen: Heraldikk på norske frimerker Oslo 1988. National Archives of Norway: Image of a penny issued in 1285. This page was last edited on 17 February 2019, at 10:21 (UTC).